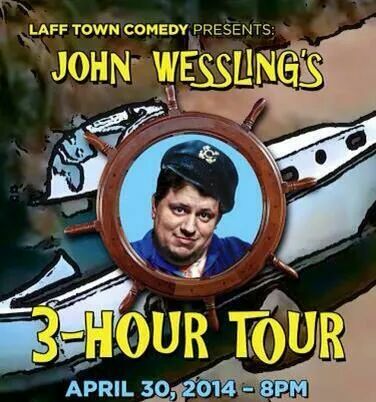 John Wessling is telling 3 hours of jokes. Yes, 3 hours! Comedy Scene in Houston talked to John about the show and why he’s doing it. Comedy Scene in Houston- Do you have 3 hours of comedy? John Wessling- Yes I do. If I just wholesale do every joke I’ve ever done on stage since I was an open micer, I have about 3.5 hours. The hard part will be remembering all of the material. But I routinely do about 2 hours of material over 5 sets on every Carnival cruise I do, and that’s with leaving out some of my edgier bits. I’ll be unearthing some of my old favorites, jokes I haven’t told in YEARS, really looking forward to seeing how it all comes together. CSiH- What made you want to do this? JW- Several things, actually. As you may or may not know, I am one of America’s premier endurance comedians. Tommy Drake, Chuck Savage and I were the first ever comedians to perform 50 shows in 50 states in 50 days (HELLGIG AMERICA, 2005) and I looked at this super long set as another challenge. Secondly, and selfishly, I wanted to go through a lot of my comedy inventory and see which ones still belong in the rotation, which ones need back in and which jokes need to be retired for good. Third, even though the haul won’t be massive, I really wanted to do some good for the Houston Food Bank. Its one of my favorite charities who do a great deal of help for people in need in the Houston area. Lots of people donate and volunteer during the holiday seasons, which is great, but hunger exists 365 days a year. So I thought doing this in the charity off season might help raise a little extra awareness for the Houston Food Bank. Plus, my really good friend and fellow Houston comedy alumnus Matt Kirsch was recently named Executive Producer of Comic Relief, the top comedy charity organization in the country. Matt has inspired me to do what I can to use my talent/gift to do some good. If this works out, I can see other headliners doing the same kind of endurance set for their fans and favorite charities. If we’re lucky, this could be the first run of a whole series of these shows, not just in Houston but all around the country. CSiH- Have you done anything like this before? JW- Nope, never done anything like this before. I’m actually fundamentally opposed to comics doing more than a 60 minute set at a show. I believe in leaving them wanting more. A comedy show shouldn’t be longer than Dances With Wolves. At some point it goes from an entertaining night out to a hostage situation, mostly due to the massive ego of the comic who just keeps on going! But this is a special situation and I think the crowd who comes out for this show will appreciate the effort. CSiH- You could charge a cover, but you decided to raise money and take food donations for the Houston Food Bank. Why is that? JW- I’m lucky enough right now to be making some good money telling jokes, so this is my way to give back a little. Whatever I could’ve made from this gig wouldn’t have made or broken me, so I’m happy to raise money, food and awareness for a great charity. CSiH- You’re a funny guy. Do you think people will stay for 3 hours? Will there be bathroom breaks? JW- I think the audience will stay for 3 hours, absolutely! I’m not up there to filibuster, I’m doing my best to make this long set a cohesive show, a virtual tour through the years of my career and some sneak peeks into whats coming up next. I won’t take any breaks…unless I’m about to piss my pants…in which case we should probably have a wireless mic on standby so I can keep it going in that emergency scenario. But if anyone in the audience needs to pee, smoke, get a drink or whatever, of course they are welcome and free to do whatever they need to do. If people can only stay for a little while or have to show up late, its totally fine for me. I’ll do my best to make sure that I’m funny for however long they can afford to pay attention. CSiH- What can the audience expect? JW- They can expect what they should always expect from a professional comedy show, to laugh repeatedly and with vigor and gusto. CSiH- Will there be any new material? JW- Yes. I won’t say how much, but there are some longer ideas and concepts that I’ve been tinkering with that I plan on running out there. It’ll be scattered throughout the show, won’t be one massive new material chunk. Like I said, really focusing on making the 3 hour show cohesive and flow together as best as possible. I’ve been fortunate enough over the years to actually build up some fans here in Houston, and I get requests all the time for some of my classic bits that have fallen out of the act for one reason and another. But I also have fans and friends who are clamoring for the new stuff and want to see where my act is heading. This 3 hour set will be great for both of those! If people want to donate cash, we’ll either give it to the HFB directly or go buy the needed items…whichever the food bank prefers.